This necklace flaunts THC molecular structure- Our THC necklace for women has a THC molecule pendant hanging from a like-colored 19″ chain. THC releases dopamine in the brain, which causes euphoria. This chemical is responsible for THC’s high and its migraine, pain, nausea, and depression-relieving qualities. This geek statement necklace comes in carbon black, gold tone, rose gold tone, or silver tone. THC molecule necklace for medical THC and CBD users and chemists- Are you passionate about chemistry or the freedom to use medical THC? Wear this medical THC necklace to show off your passion for THC or chemical structures in general. Its unique shape and science-oriented nature make this necklace a natural conversation piece. 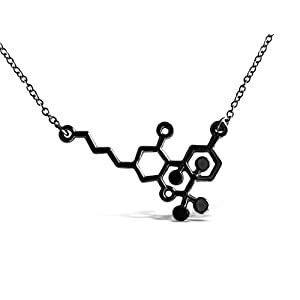 Plus, this chemical structure necklace will add some dimension and fun to your outfit.